Added on April 18, 2019 by lauren frances evans. Added on February 2, 2018 by lauren frances evans. Added on October 30, 2017 by lauren frances evans. I'm excited to be the featured artist for the next edition of PromptPress. Writers have been submitting works in response to several images of my work. Eventually, they will be published in a limited edition collectible art book. Can't wait! ABOUT PROMPT: PromptPress provides inspiration for and invites collaboration between writers and visual artists. We believe cross media collaboration is vital to the creation of boundary pushing work. Prompt provides a space for artists to connect, study each other’s work, and publish within the national scene. In our exploration of how word becomes image, becomes word we invite book artists, for whom words are images, to design special editions of our bi-annual print journal. Added on February 27, 2015 by lauren frances evans. Added on November 6, 2014 by lauren frances evans. How would you describe your process? How do you begin a new sculpture or drawing? How much do you plan before you begin making a new art object? I really don’t plan much at all. 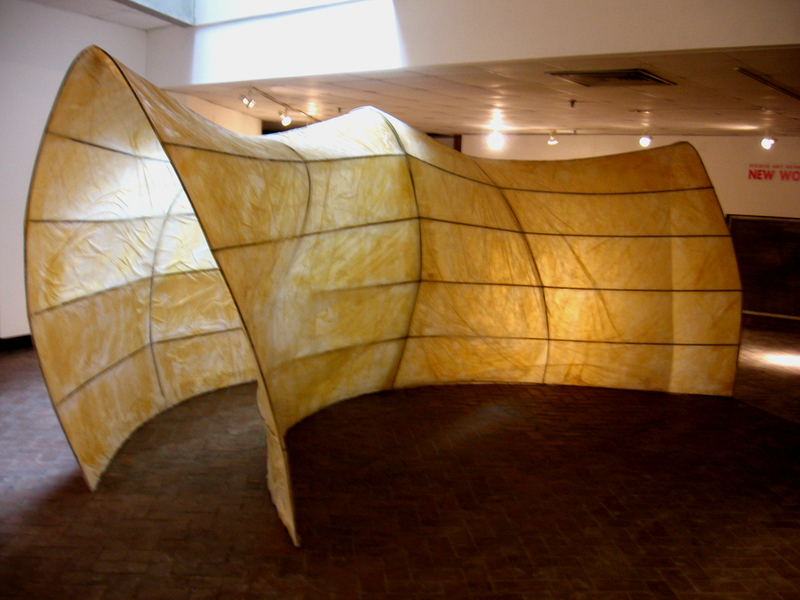 I used to make these large-scale site-responsive installations out of wire - and for those I would make scale models so that the form was determined ahead of time. But I’ve since moved away from that way of working. I was craving a more playful studio practice in which multiple projects would evolve at once. This was most likely due to the time and freedom that grad school allowed/encouraged/required of me. What a luxury. I’ve learned much about myself, my materials, and my work in general through this mode of working. Often projects begin on impulse - perhaps I’m drawn to a particular material, how it feels between my fingers. I poke at it and prod at it until it becomes something interesting. The forms tend to arise out of these impulses. And then certain things are revealed in their becoming. Don’t get me wrong - I think a lot about my work. I read a lot too. But most of my thoughts surround the creative act itself, rather than the motives behind it - for I believe the impulse itself is primary. How did your work developed from undergraduate through graduate school? Did the themes, materials and concepts stay consistent throughout your education? If not, can you tell me a little about the path you took until you found your way to the current work? Sometimes I feel like it’s changed so much - but then ideas and forms reappear all the time. I’m still looking at the same types of artists. My work is still biomorphic in form. The scale has shifted a bit - in undergrad most of my work was large enough to walk through, often tunnel-like or cave-like, while now I primarily make objects at human scale (or much smaller), but I think I’m still dealing with most of the same ideas - the body as a microcosm, the flesh as a metaphor, a familiar ambiguity, an abject beauty, etc.. The materials have evolved, but are still referencing the flesh for the most part. I used to make a lot of gridded wire armatures (which I would leave exposed) and those have pretty much vanished, but mostly due to the shift in scale and form. Like I said above, my studio practice has become much more playful. Much of this was due to the sentiment of my 3-yr interdisciplinary MFA program which insisted that I try all kinds of things and not get stuck in my ways. The space I had in grad school allowed me to start something, abandon it, revisit it, reorient it, and turn it into something else entirely. Many things got revisited, but lots of things also went in the dumpster when I finished, simply due to lack of space. While in grad school I became much more comfortable working in 2 dimensions - in undergrad I couldn’t imagine making anything but sculpture. Working with collage provided a much quicker way to work, which then led to making small assemblages, and then the larger assemblages which I am mostly making now. I just wanted more. I went straight from undergrad into my MFA program because I wanted more, and I wanted it right away. I had done a residency (at Franconia Sculpture Park) the summer before my senior year of undergrad and being around all the professional artists there really encouraged me to pursue an MFA. It was invigorating. I wanted to be an artist. I was eager to learn more about art theory and art history, and was eager to keep developing my work among a group of other motivated artists. At the time I was also doing a lot of welding and really felt that I needed to be in an academic environment so I had access to all the tools/facilities. Ironically, I haven’t done much welding since. Teaching was also a big factor. Do you plan to teach in the future? Or are you planning to go the gallery route? How do you see your work developing in the future? Do you plan to continue working with the same themes? I definitely would like to teach. I was lucky enough to get lots of experience trying my hand at it in grad school (as a TA all 3 years and as an instructor for 2) and enjoyed it enough to want to keep going. I’m currently teaching an advanced sculpture course at the University of Iowa and if I could teach teaching classes like this the rest of my life I’d be happy (unfortunately this is just a temporary leave-replacement gig). Of course that’s not all I want to do - my work will/should always be primary. My husband and I are also interested in starting/running some sort of non-profit gallery and educational arts space one day, but that will depend on wherever we end up - we’re still young. I’m less interested in gallery representation, if that’s what you mean. If it happens one day and it’s a healthy relationship, fine - but I’m not going to chase after it. And I have no burning desire to move to NYC. I’d rather show my work in non-profit spaces and educational settings (university galleries) than have to worry about making work that sells. I imagine the themes of my work will evolve, but I also feel like there’s still a lot of terrain to be explored within the areas I’m currently researching/thinking about - so we’ll see. I hope it will mature with time, but I have a feeling it will always somehow relate to the body, desire, holes, positive/negative space, boundaries, betweenness, becoming, etc.. In your artist statement you talked about curiosities of human experience as your main influences for your work. Is this tactile idea of boundaries, bodily holes and desire something that has always influenced your work? What are some of your other influences and enthusiasms? Yes, I think it has always been an influence. It goes back to those urges and impulses of childhood - picking my nose, poking at blisters, popping pimples, trying to flit my belly button inside out - all those weird things that we’re taught to stifle as we age. I’m influenced by philosophy and theology - my Christian faith permeates my work in ways I can’t even understand - but am always trying to figure out. I believe that all creative acts are efforts to comprehend our origins (however abstract) and are attempts to narrow the distance between the human and the divine, the here/now and the beyond - so I can’t escape that theological component. I think it’s a human thing (rather than a religious thing). I also love kids - their curiosity and enthusiasm is a huge influence. What is the intent of your work? Do you see it functioning as a conversation, a statement, or in some other way? Good question. I’d say more of a conversation than a statement. I don’t see my work as having an agenda of any kind or serving any instrumental purpose. I’m more interested in talking about the whys of making at an ontological level. Why is there something rather than nothing - why make anything at all? My work comes out of these questions. So the works themselves are wrapped up in paradox - the simultaneity of opposites. I’m asking questions - hoping the work will make others question - as opposed to providing answers. How do you see your 2-dimensional and 3-dimensional working together? Is one important to the other? Or, are they completely separate approaches? They inform each other. I think of my 2D work in a very sculptural way - so they’re not much different for me from the 3D work. 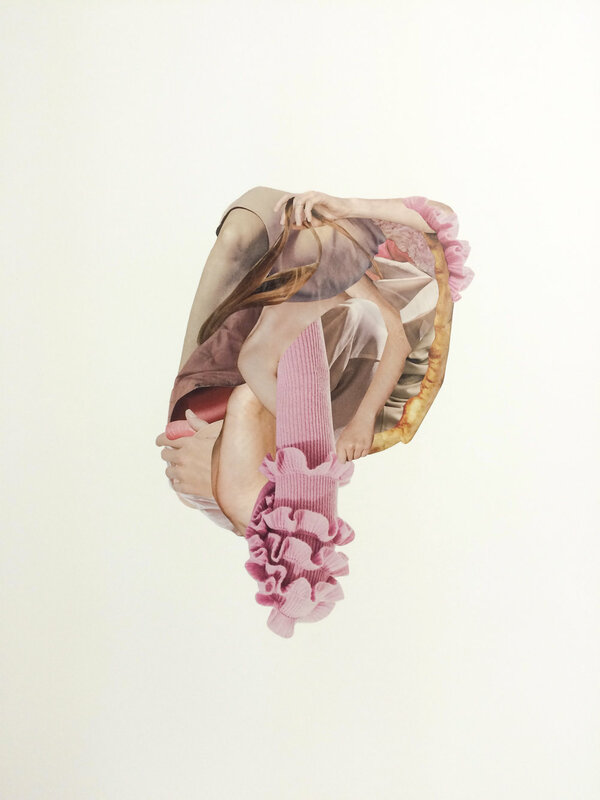 The collages (and drawings) are quicker, definitely (except for the Decreation collages! ), and they enable me to work out how I want my work to feel. They aren’t sketches for sculptures, but sometimes after making a collage, I will then attempt to make a sculpture with a similar feeling. There’s a certain elegance to the 2D work that’s been more difficult to achieve in 3 dimensions - but I’m working on that. How do you want viewers to engage with your work? Are there any performative aspects of your work? How to you envision viewers to experience the work? I used to think of the viewer more than I have been recently. Certain pieces invoke more interaction than others. There’s definitely this desire to touch, but at the same time a certain abjection. That push-pull effect really fascinates me. I’m more interested in how the piece makes the viewer feel - do you want to stick your finger in it, climb inside of it, stroke it, grab it, etc.? I’ve got a show coming up in February at Jacksonville University and have been in discussion with the dance department about how to possibly involve the dance students in the work - perhaps some improvised interactions with the work - should be interesting and hopefully will reveal new things to me about the things I’m making. How do you see gender operating in your work? It seems from looking at the work that gender would be a theme but I didn’t see it mentioned in your statement. Is it less about gender, but rather about the body itself? Correct - definitely less about gender and more about the human experience - embodiment and incarnation as a human thing, and not so much a gendered thing. That’s a big can of worms, and I think my work is about something more broad, so I usually steer the discussion away from gender. But of course a lot of the materials I’m using are typically used by females - the hair extensions, the false eyelashes, even the fashion magazines I use for collage - so I understand why the conversation may go there - but for me it’s about longing in a much deeper sense, not just the longing to be beautiful, but that’s part of it too. My preoccupation with holes is often read as psychosexual - and sure, that’s part of it, but for me holes point to this broader human void of longing that I think men can relate to just as much as women. I have noticed a difference though in how men/women respond to my work - I made a sculpture once that read as ovaries to a lady professor and as balls to a male professor - maybe that’s the kind of ambiguity I’m after - we’re not so different, really. That’s also why the navel is the hole that fascinates me most. It’s this hole (or bump!) shared by us all which points to our origins. What is your intent in using animal parts as well as synthetic materials such as hair extensions and acrylic nails in your sculptures? I’m typically drawn to materials for their formal properties - how they feel and look - and the body/flesh, to me, it the most fascinating material there is, so I naturally choose materials that mimic the body in those ways. There’s an organic/synthetic thing going on, but again, I’m more interested in blurring the lines there. I use a lot of synthetic materials that looks natural, but when paired with the all-too-real animal intestines something happens which makes you question the authenticity of the rest of the materials. You’re not sure what’s real and what’s artificial, and that’s what I’m after. That balance keeps the work in that surreal realm of the uncanny. Added on October 22, 2014 by lauren frances evans. Added on October 15, 2014 by lauren frances evans. Added on October 13, 2014 by lauren frances evans. Added on October 12, 2014 by lauren frances evans. Added on June 24, 2014 by lauren frances evans. 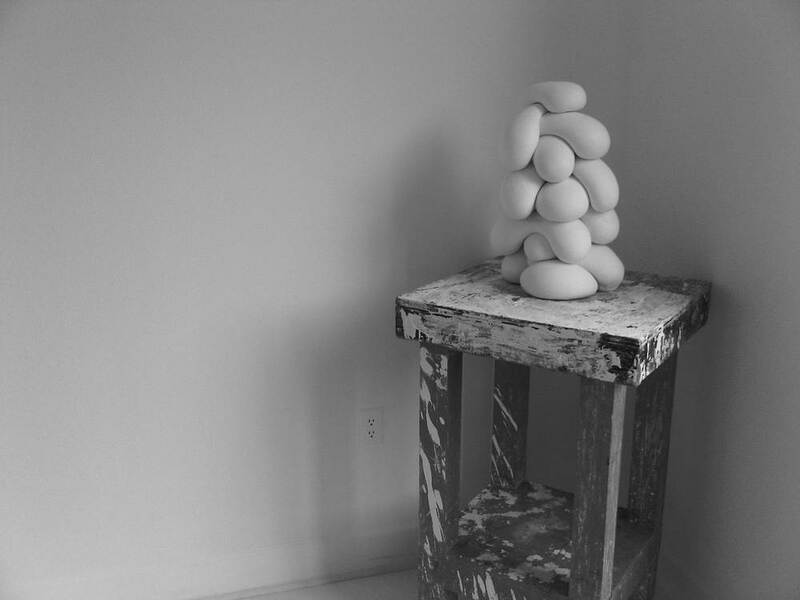 I'm pleased to announce that I am a recipient of the International Sculpture Center's 2014 Outstanding Student Achievement in Contemporary Sculpture Award. This piece, pictured below, will travel to Grounds for Sculpture in New Jersey for an exhibition which opens in October and then it will be part of a traveling exhibition - additional locations are still TBD. I hope I'll be able to make it to NJ for the opening/party! The International Sculpture Center (ISC) established the annual "Outstanding Student Achievement in Contemporary Sculpture Award" program in 1994 to recognize young sculptors and to encourage their continued commitment to the field. It was also designed to draw attention to the sculpture programs of the participating universities, colleges and art schools. The award program's growing publicity resulted in an exceptional number of participating institutions; including over 151 universities, colleges and art school sculpture programs from six countries for a nominated total of 374 students. A distinguished panel made up of Kathryn Mikesell, Founder of the Fountainhead Residency and Studios, Miami, FL; Stefano Catalani, Director of Art, Craft & Design at the Bellevue Arts Museum in Bellevue, WA; and Donald Lipski, Sculptor, NY selected 22 recipients and 25 honorable mentions through a competitive viewing process of the works submitted. The selection of the recipients from a large pool of applicants, including international students, is a great accomplishment and testament to the artistic promise of the students' work. The 22 award recipients will participate in the Grounds For Sculpture's Fall/Winter Exhibition, which will be on view from October 2014 – March 2015 in Hamilton, New Jersey, adjacent to the ISC headquarters. 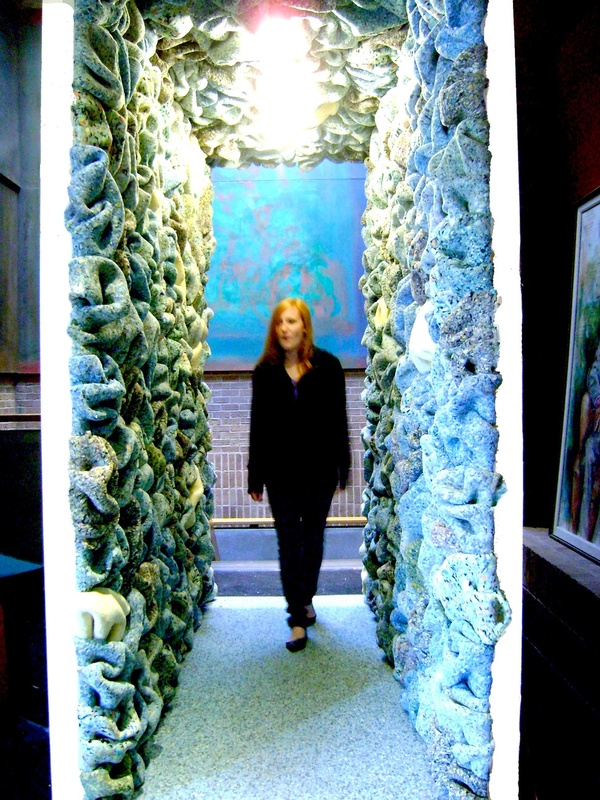 The artist's work will be featured in the October 2014 issue of the International Sculpture Center's award winning publication, Sculpture magazine as well as on the ISC’s award-winning website at www.sculpture.org. The International Sculpture Center (ISC) is a member-supported, nonprofit organization founded in 1960 to champion the creation and understanding of sculpture and its unique, vital contribution to society. Members include sculptors, collectors, patrons, architects, developers, journalists, curators, historians, critics, educators, foundries, galleries, and museums-anyone with an interest in and commitment to the field of sculpture. I just shipped this piece to Cincinnati, OH for an upcoming exhibition at Manifest Galley. The show opens on July 11th and will be up through August 8th. Wish I could make it for the opening! 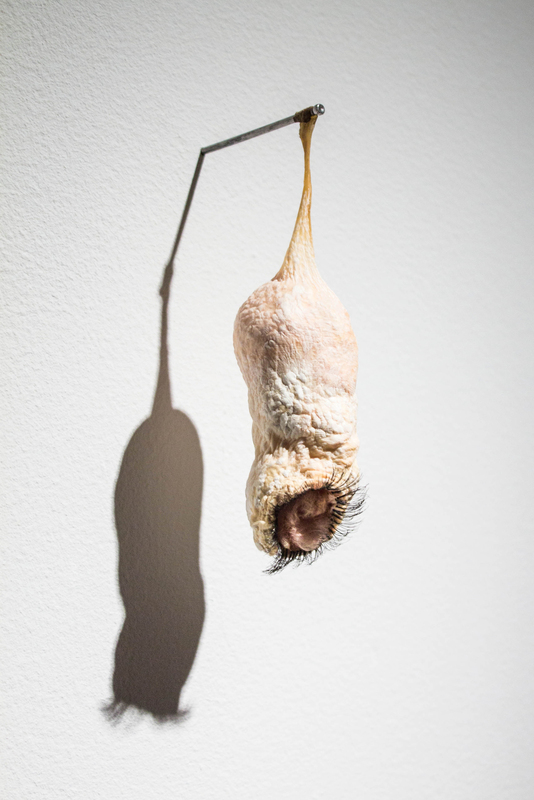 Dangle - 2013 - beef intestine, fiberglass insulation, and false eyelashes - 6" x 2" x 2"
This eighth installment of the Master Pieces project will continue to reveal the intensity and professionalism of students working towards their terminal academic degree in the field of art or design. Often the most exceptional work comes out of these artists’ immersion in their culture of study and intellectual pursuit. Manifest’s goal, therefore, is to select and document works that in the truest sense of the word are contemporary masterpieces – works that set the standard of quality that the artist is expected to maintain throughout his or her professional career. The exhibit catalogs for Master Pieces, and now theManifest Exhibition Annual, will serve as a visual documentation of these artists’ own benchmarks for years to come. For this incarnation of the project 148 artists representing 79 different academic graduate programs submitted 402 works for consideration by Manifest's rigorous jury process. 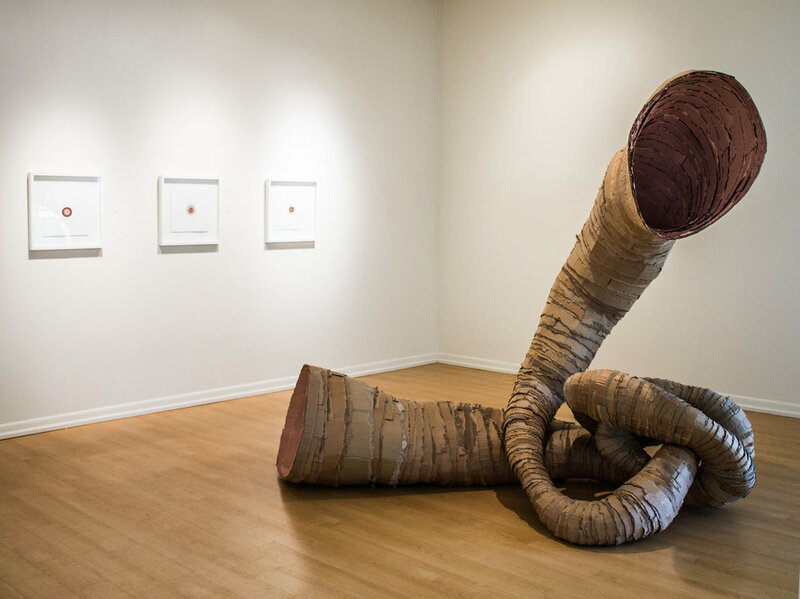 Twenty-eight works by 21 artists from 15 states representing 20 different academic programs were selected for presentation in the gallery and catalog. Added on June 21, 2014 by lauren frances evans. ... There is something else that I am very interested in pursuing a little further. Something that does make me a little uncomfortable. While I affirm in-betweeness I also wish to say that there is nothing in-between about this at all. The void works are for me a poetic and spiritual concept. In-betweeness is a statement of cultural certainty and not one of cultural ambiguity. If we are to speak of void as in-between then it is not in-between two predefined cultural realities, but, in-between in the sense that it is potential, that it is becoming, that it is emerging, that it is probable, possible. Added on June 20, 2014 by lauren frances evans. Added on June 14, 2014 by lauren frances evans. Evans and Little shared a studio wall during their graduate school careers. This wall has become a place to hang works in progress, pin up quotes, and an intermediary through which they continue to exchange ideas. Their collaborative piece, Point of Meeting, is a reification of their creative research and a nod to this shared experience. “The world is the closed door. It is a barrier. And at the same time it is the way through. the password for the video is "POM"
Added on June 13, 2014 by lauren frances evans. I'm currently in the thick of teaching 3 sections (of various levels) of drawing this summer, and it's really got my head spinning (in more ways than one). Upon reading his response (and challenge) to Jerry, I clicked my way to Ruskin's Elements of Drawing. The full text is here on project gutenberg. Though I probably won't be assigning these exercises to my students any time soon, they embody and reinforce the value of really seeing which I am constantly shoving down their throats (whether they realize it or not). Added on May 29, 2014 by lauren frances evans.